Barefoot Resveratrol Anti-Aging Tonic: Anti Aging Resveratrol: Do all brain cells begin dying during Adulthood? Anti Aging Resveratrol: Do all brain cells begin dying during Adulthood? Not at all. True, the human brain develops most between infancy and adolescence. However, this doesn’t mean neurons start dying afterwards. Yes new neurons are created all the time, while existing neurons continue to change during adulthood. New research has discovered new neurons are created daily in adult mice. However, these neurons tend to die rapidly without sufficient brain stimuli. The study determined that, when cognitive abilities of mice are challenged, their new cells remain active. Otherwise, their new neurons are likely to die. According to Dr. Peter Whitehouse, who played an important role in brain research which led to the first four medications for treating Alzheimer’s, instead of medication, the focus should be on preventing brain aging through simple strategies like exercise, reading and eating right. I’ve been taking Vivix since Shaklee first introduced it on 8/8/08. I’m a pretty healthy person and didn’t expect to notice much difference. I started taking it to protect and prevent disease. I was suprised when I started dreaming at night and waking up and remembering my dreams. This might not seem like a big deal to you, but for me anything I can do to help my brain function better I’m going to keep taking. After having such eye opening results with Vivix. 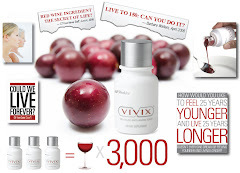 I decided to start writing and sharing information about resveratrol, anti-aging and Vivix.